The Super Xiaomi Bluetooth Selfie Stick is here…but can it stand up to this Selfie Queens Tests?? 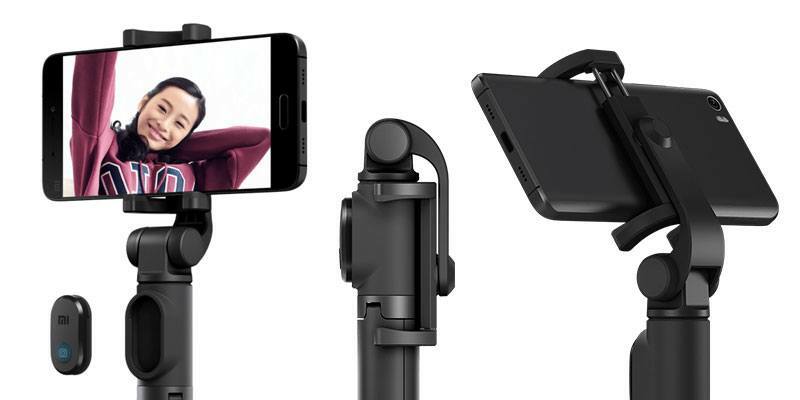 In a few short years, selfie sticks have gone from something you’d buy at a petrol station… to the stylishly designed Xiaomi Bluetooth Selfie Stick that even comes with its own detachable wireless remote. And… that’s not all! The clever cloggs at Xiaomi have even built a tripod into the handle for when your arms just aren’t long enough. The first time I used a selfie stick was on a trip to Amsterdam… it was mainly just to see what all the hype was about but BOY was I impressed! My holiday pics were taken to the next level! Once you get over the initial… ‘selfie stick embarrassment phase’… using a selfie stick feels like second nature. Best of all you can really see the difference in your photos as you capture all that glorious panoramic background with an angle so high your chins are nowhere to be seen! I decided to brave the 40-degree weather and travel by boat to see the famous Wat Arun temple in Bangkok. My first impressions of the Xiaomi selfie stick are good as I’ve managed to pack my tissues, purse, sun cream & hand sanitizer into a small side satchel and still have room for the Xiaomi selfie stick as well. Measuring only 19 cm in length thanks to the clever foldable design means that you can fit this selfie stick into even the smallest of bags. It’s also lightweight at only 155 grams so is a good travel companion. Two features I’m excited to test out, (that help the Xiaomi Selfie stick stand out from the competition), are the tripod mode and removable Bluetooth remote. If you’ve ever tried balancing your smartphone on the end of selfie stick in the midday Bangkok sun, you’d sure appreciate not also having to use superman-like thumb strength to hit that shutter button. Well… now you don’t have to! Just grab the shutter remote and take the photos with your spare hand. Even better, get your boyfriend (on some random stranger for you singletons) to hold the selfie stick and then you can focus on timing your holiday smile perfectly. The Xiaomi Selfie stick will fit smartphones between 56 to 89mm width which includes the Samsung S8 / S8+, iPhone 8 / 8 Plus and the Xiaomi Redmi Note 6. I tested it out for the day with my OnePlus 5 which at 5.5 inches had plenty of room to spare. The speed at which smartphones are moving to 18:9 and even 21:9 means that this selfie stick should last you a long while yet (…thanks to the thinner width ratio…). So, how easy is it actually taking those selfies? It’s quick and easy to set up, just hold down the camera button on the Bluetooth remote for 2 seconds until the button flashes blue. The selfie stick will appear as ‘XMZPG’ in your phone’s Bluetooth settings then you’re ready for selfie time! As the handle on the Xiaomi Selfie Stick is slightly thicker due it housing the tripod, I actually found it much easier to grip and hold onto. If you don’t fancy the tripod mode, the actual aluminium rod isn’t that long and is probably the smallest selfie stick that I’ve used. Depending on how wide the angle on your camera phone is, you might struggle slightly to get all that you want in the frame. 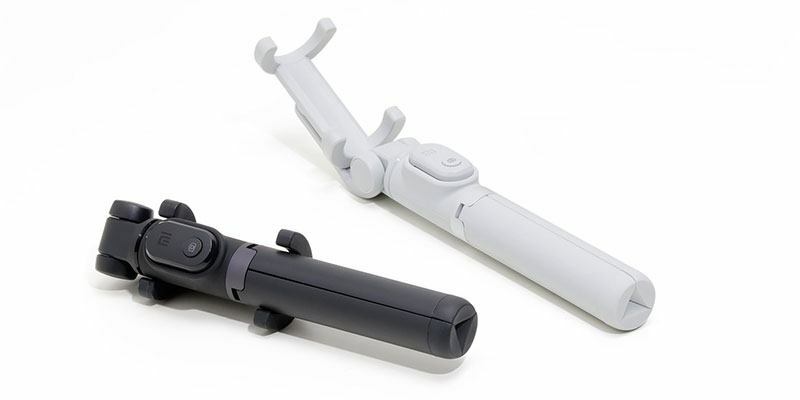 Another plus point is that unlike some cheaper selfie sticks, the Xiaomi Bluetooth Stick has plenty of rubber grip on both sides of the phone clamp. This gives you a very secure fit without feeling like you’re crushing your smartphone. What sets the Xiaomi Bluetooth Selfie Stick apart from the competition? A quick search on Amazon brings up 100s of different selfie sticks with varying extension lengths and features. So with so many options… why should you choose the Xiaomi Bluetooth Selfie Stick? Well… to help you decide I’ve highlighted some of the reasons why I think this Selfie Stick is awesome! Gone are the days of setting a 10-second timer on your phone and then Usain Bolt’ing your way back into the photo. 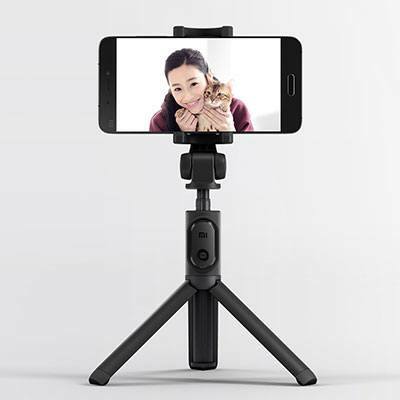 The sturdy non-slip tripod can be setup in seconds and then you can use the detachable Bluetooth remote. In addition to being just 19cm folded up, it also weighs only 155 grams. While not the lightest selfie stick, it’s easy enough to carry around all day. The Xiaomi selfie stick feels great in your hand with the soft touch plastic around the remote case being a nice premium touch. The extension rod itself is also made from Aluminium with the whole stick feeling solid and durable. 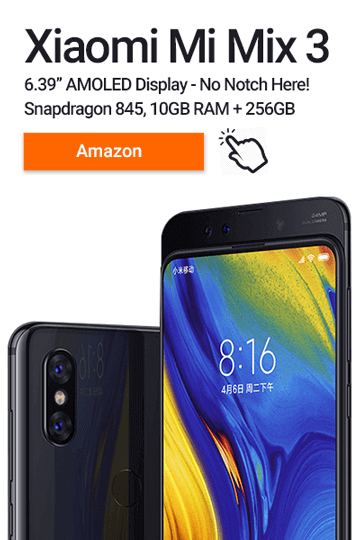 Since the Xiaomi selfie stick works off a Bluetooth remote, it’s not going to become useless once smartphones eventually move away from having a headphone jack. The selfie stick arrives packaged in a standard minimalist white Xiaomi box. The version I received came with Chinese writing and instructions but I’m such a tech whiz kid… I worked out how to put my phone on all on my own! Overall, the Xiaomi Bluetooth Selfie Stick is a stylish and versatile addition to any selfie-queen’s life. Also, thanks to the compact design and lightweight construction it’s a welcome handbag-friendly companion. Although there are cheaper Selfie Sticks out there that offer similar functionality… They don’t quite match up in terms of build quality. A selfie stick is for life… not just for Christmas… so invest in one that you’ll be proud of!